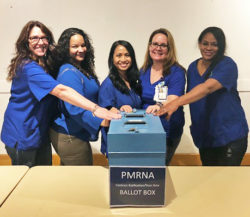 On March 21, members at Pettis Memorial Registered Nurses Association (PMRNA) voted unanimously to approve our tentative contract agreement. In support of a strong effective affiliate, our members also overwhelmingly approved a dues rate increase. The vote successfully locked in multiple improvements to existing contract language and added many new Articles to the agreement. This strong agreement would not have been possible without our collective strength and commitment to improving our power in our workplace.